Honolulu Museum of Art Free Entry on the Third Sunday of Every Month. Every Bank of Hawaii Sunday! 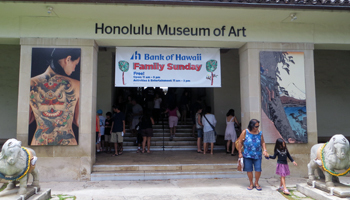 Although the Honolulu Museum of Art is normally a paid attraction, the Bank of Hawaii sponsors one Sunday per month (the third Sunday) when the public can enter for free. Then, in addition to viewing the exhibits, there’s an ever-changing variety of entertainment and activities for children. Though not a sponsored event (that I’m aware of), the museum also offers free admission on the first Wednesday of each month. When my family last visited the Honolulu Museum of Art, the theme for that free Sunday was ARTageddon. We brought a picnic lunch to eat in one of the courtyard gardens, and then we got down to the business of having fun. There were music and dancing acts, balloon artists, craft tables (for the kids to make pom-poms out of recycled grocery bags), and a lady who made bubbles. I realize the bubble lady probably sounds anticlimactic, but WOW! 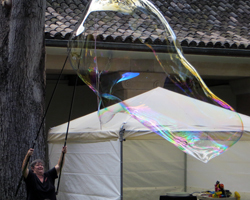 She made bubbles within bubbles, smoke-filled bubbles, a bubble volcano, and bubbles nearly the size of a small car! Needless to say, we were impressed! Note: the Honolulu Museum of Art is one of the Oahu attractions you can experience any day using the Go Oahu Card… Over 30 Oahu Attractions, Tours, Museums, Activities & Sights for 1 Low Price are included with the Go Oahu Card! Link opens a new window/tab. 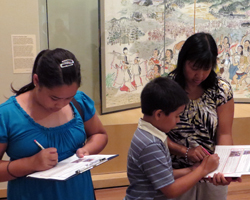 During these free family Sundays, the Honolulu Museum of Art encourages children to tour the exhibits by offering small prizes for completing an art-related scavenger hunt. The art on exhibit is all very appealing. However, the collection isn’t nearly as extensive as many of the art museums I’ve visited on the U.S. mainland and in Europe. Furthermore, the two main galleries in the main building prominently display Chinese and Japanese art collections (which are nice, but not my favorites). 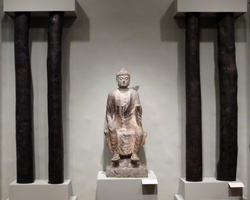 However, if Asian art is most to your liking, this will suit you just fine. Since events are usually held at the main building, I tend to see the same two collections repeatedly – even though there are other collections in other buildings around Honolulu. Thus, based solely on the main exhibits, this Honolulu art museum isn’t my favorite. But that’s just my opinion. 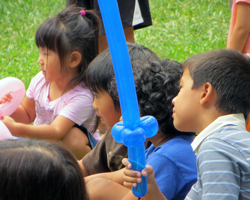 Meanwhile, my kids had a great time at the Bank of Hawaii free Sunday event, which has been going on every month since 2004! The entertainment acts vary from month to month, but it is likely that you'll see performances and demonstrations similar to those we enjoyed. All in all, I’d say that if you have kids, you should bring them to a Bank of Hawaii Sunday at the Honolulu Museum of Art. But if you are without kids, it’s up to you whether you want to join the crowds for free or just pay the usual $10 entry fee to come enjoy the exhibits on a quieter day.